There have been a few discoveries found in the iOS 4.2 beta 2 that was seeded to developers a couple days ago. 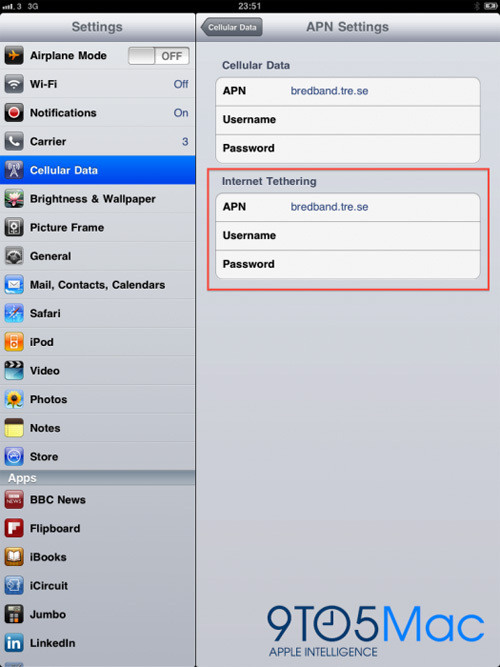 Perhaps the most interesting is an internet tethering option for iPad shown in the image below. As you can see from the image, some users are getting an internet tethering section within “Cellular Data” in the iPad’s Settings.app. This is most likely a tethering option the same as many iPhone users currently have access to, depending on the carrier. Unfortunately for US users, no one is reporting seeing this tethering option, leading many to believe the feature will be region specific with AT&T customers not included. Another interesting discovery found in the latest iOS beta was a new animation for multitasking on the iPad, which can be seen in the video below c/o of our friends at 9to5Mac.